All better now. Thanks, Mom! When Miss Gracie recently developed those distinctive greenish eye boogers, I wondered if there was a home remedy I could try before hauling her in to the vet. Especially since I never seem to get her out of there for less than $75. Fees, tests and meds add up fast! I asked Uncle Google, and he served up several variations of this recipe, plus a lot of heated discussion about whether or not it is humane to try home treating your pet. And a lot of scolding about how if you can’t afford a vet, you shouldn’t have a dog, blah, blah. I think that, just as with human illness, if the situation doesn’t seem dire, it’s ok to try the equivalent of “chicken soup” before running to the professionals. It’s all about judgment. That said, eye infections can be serious business, and if the eye is crusted shut or partially shut, the animal is in distress, or if you know there is a scratch or wound to the eye, do not try home treatment. A dog can lose an eye very quickly to an infected scratch (vets call them ulcers). The eye can literally liquefy and run out! So if in doubt, please go to the vet. Right away. Drop 20 eyedropperfuls of fresh lemon juice into 1 cup of water. Cover the container. Shake well every time you use. 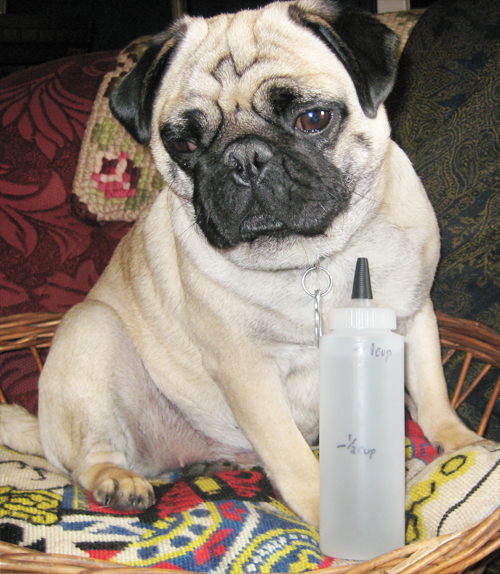 Drop a few drops into your pet’s eye 3 times a day for a few days to clear up the infection. If at any time the infection worsens, go to the vet– the drops are not working! Do not keep the drops longer than 1 week. I only treated Gracie for 5 days. She showed improvement on the morning of the second day and the infection was gone by the fourth day. It’s important not to keep the mixture around too long, it will sprout mold in the container. Mine molded after 10 days. You could refrigerate it, but I chose not to for Gracie’s comfort. I found the ideal container was a “ketchup” style bottle. I could squeeze it right over her eye and plenty would get in, despite all the wriggling. You can sterilize the bottle and use distilled water if you wish, it certainly sounds like good practice. But I didn’t, and it worked OK anyway. This mild solution will not sting (you can try it on yourself), and in fact many over the counter human eye drops contain citric acid, so it is a safe substance to put in the eye in mild concentrations. Many people say they use this recipe for cats and humans as well. Please Google first; I can only vouch for my successful dog experience! Again, this is for mild infections only. If the eye is crusty, scratched, swollen shut or at half-mast, please go to the vet.